Title: What do you care? 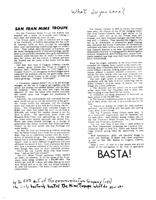 Abstract: Reprint of EVO article (East Village Other) on the S.F. Mime Troupe bust in Calgary. Style of writing reveals intimate connection with the Troupe's politics & history. In ComCo handwriting: "The dirty bastards busted the Mime Troupe what do you care" "The Troupe, formed in 1959 by Davis, has always been poor, but always on top of the changing times: The first Dance-Concerts and Light shows..were put on by the Troupe.. They spawned the Diggers, who set up an alternative to competitive game playing;.."
The San Francisco Mime Troupe left Buffalo last weekend and a whole lot of people were looking at each other and wondering about courage. The Troupe spent a week in seminar and on stage at the University of Buffalo demanding that the youth of America build up their courage by sabotaging their 'cool' and bombing conditioning right out of their lives. They talked about the power of autonomy, and the never-changing quality of Sabretts hot dogs, and the need to put cynicism, escapism, fear, guilt, and idealism instantly aside because this is really it--now is the time for action and the culture is extinct and soon the forests and the caves of the future will be seen clearly. And then they went to Calgary, Alberta, Canada. A student group invited the Troup to Calgary to perform their "Minstrel Show or Civil Rights in a Cracker Barrel", an outrageous musical plague which confronts the audience with its own guilt-ridden fears while Rufus Blood stands on the corner of 125th and Lenox grinning: "Uptight? Outtasight!" A University regency doesn't like to be put through changes, so the one in Calgary got together with the police and planted two student 'guides' with the theatre company. When the time was right, the cops appeared all over the place with search warrants and busted actor Lee Vaughn for possession of marijuana. Naturally, the establishment was convinced that the show would not go on, but the versatility of the guerilla Troupe allows for ambushes and the missing actor was replaced in his role by R.G. Davis, the director. The disappointed cops released Vaughn on $1000 bail (they had asked the court to set bond at $100,000) and waited for another chance to put the show to death. The opportunity never arose and Minstrel-Show-Time was approaching, so the cops got some more search warrants and seized R.G. Davis and actor Ronald Stallings on a charge of possession (the police reported that Davis had some 'flakes' in his coat pocket and Stallings had some seeds). By then the fuzz had everyone in Alberta believing that the Mime Troupe was a front for an international dope ring out to undermine society with the distribution of fiendish drugs. The courts, subsequently, denied bail to both defendants. A.M. Harradence, their lawyer, went to three different magistrates and each affirmed the denial of bail. Upon conviction the three will face a minimum sentence of two years in prison, even though they have no prior narcotics arrests. That's the way Canada deals with 'dope fiends', baby, "and we don't kid around!!" The S.F. Mime Troupe performs FREE SHOWS all week, all summer, in all the parks of San Francisco while being crushed by a $15,000 debt. The actors get paid $5 a show, and when they go on tours they always end up in the red, but its got nothing to do with bad business: The Mime Troupe just doesn't compromise. The Troupe, formed in 1959 by Davis, has always been poor, but always on top of the changing times: The first Dance-Concerts and Light shows in San Francisco were put on by the Troupe when Bill Graham was their business manager and Chet Helms was still a Catholic. They spawned the Diggers, who set up an alternative to competitive game playing; they attracted the Burns Committee on Un-American activities with their brillian [sic] satires, caused nice-old-man Kenneth Rexroth to tab them 'provacateurs', and cultural stupefaction while holding their plastic Commedia baseball bats high over their heads and wailing: KILL VOYEURISM. Since its origin, members of the troupe have been arrested for singing Xmas carols in the street, performing their Commedia Dell'Arte productions in the parks without a permit, unlawful assemblies, violations for fire, health, city and state ordinances, but have never been convicted of any of these charges. 1. The director and two actors are in a jail 3000 miles away from San Francisco and it looks like they're going to stay there for two years. 2. Creditors are being pressured to foreclose on their pieces of the $15,000 debt. 3. The Hearst Corporation wants to kick the Troupe out of their studio and use it as a warehouse for its lies. 4. There's no money, no credit for rent, costume material, and everything else that goes into putting a new show on the boards. The San Francisco Mime Troupe needs help. 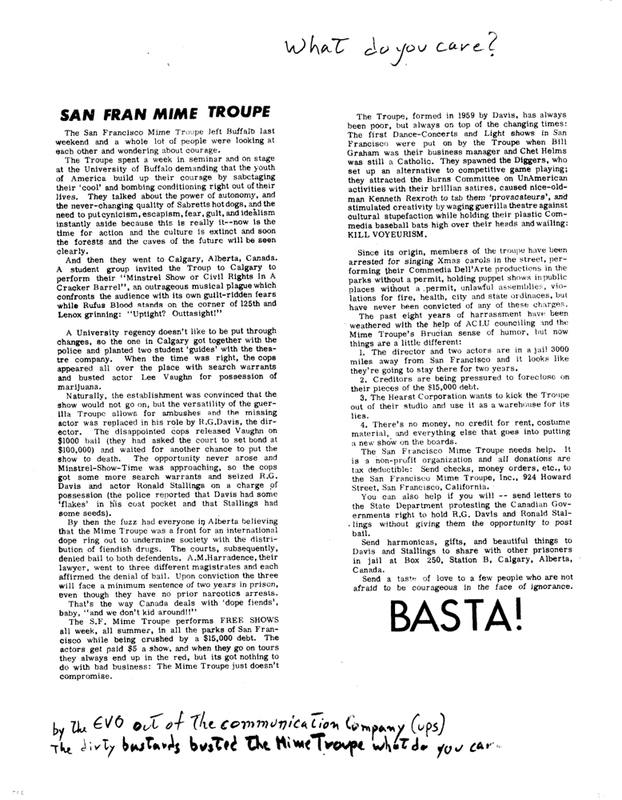 It is a non-profit organization and all donations are tax deductible: Send checks, money orders, etc., to the San Francisco Mime Troupe, Inc., 924 Howard Street, San Francisco, California. You can also help if you will -- send letters to the State Department protesting the Canadian Governments right to hold R.G. Davis and Ronald Stallings without giving them the opportunity to post bail. Send harmonicas, gifts, and beautiful things to Davis and Stallings to share with other prisoners in jail at Box 250, Station B, Calgary, Alberta, Canada. Send a taste of love to a few people who are not afraid to be courageous in the face of ignorance. Trans Title: What do you care?